THE RISING (c. by Flying Pegasus). 7 wins. See below. Vital Detail (g. by Vital Equine). Winner at 1000m in Aust. Dutch Harry (St Covet). 4 wins-2 at 2-at 1200m, 1600m, A$291,650, Qld Tatt's RC Tattersall's Open Mile, GCTC Queensland Events Corporation 2YO H., Qld Tatt's RC City Rowers H., QTC Copperama 2YO H., 2d BTC Champagne Classic, Gr.3, QTC Q&S Migration Services 2YO H., BTC Hahn Premium Light H., 3d Qld Tatt's RC Australia Post S., L, QTC JF Meynink S., L, Qld Tatt's RC Franklins Supermarket 2YO H., QTC Star of Bethlehem H., Full Suit Welter H., 4th BTC Courier-Mail Classic S., Gr.3. Sire. Penola. 9 wins-1 at 2-to 1350m, A$163,250, QTC Lord Penn Welter H., BTC Queensland Rugby H., Bimbadgen Estate Wines H., MRC Coal Pak H., QTC Mt Olivet H., Sierra Queen H., 2d BTC Australian Red Cross 2YO H., Mr Deeds H., Legacy H., Rowan Hot Dog Robertson Memorial H., Sky Channel H., 3d BTC Fish Restaurant 2YO H., Sky Channel Doomben Dash H., QTC Bernborough Club Welter H.
Count Milano. 5 wins to 1400m, A$207,140, AJC Groomsbridge H., STC Woodlands Stud P., 2d Gosford RC United Financial Services Crackerjack H., AJC Santa's On HIs Way H., Members ANZAC Memorial H., Fresh Flowers H., STC Theraces.com.au H., Book Now for Golden Slipper Festival H., Camden Hire P., Kerrie Ann Haute Couture Headwear H., Smiths Chips H., Hawkesbury RC Richmond Club H., 3d AJC Schweppes Tonic H., Canon Wishes You a Merry Christmas H.
Cool Million. Winner at 1200m, 3d WATC Mines Rovers Football Club H.
My Haven. 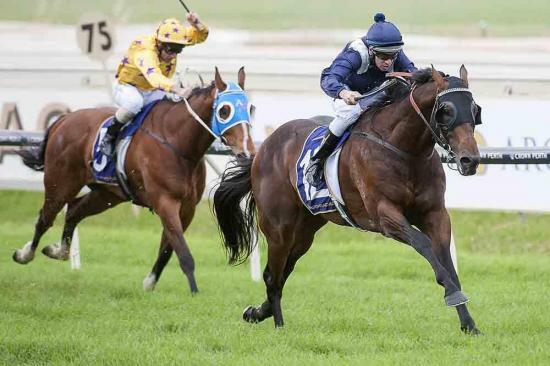 Winner at 950m in Aust. MR HORNBLOWER (Admiralty). 10 wins from 1000m to 1600m, A$657,400, GCTC Prime Minister's Cup, L, Ipswich TC Eye Liner S., L, BTC Tate Mason the Good Guys H., Eventageous H., Kedron Wavell Services Club H., UNI Quest P., Russ Daniels The Good Guys H., QTC Turridu H., John Holland Mile H., 2d BTC Sprint H., Gr.3, Ipswich TC Eye Liner S., L, 3d BTC Sprint H., Gr.3, BTC Bernborough H., L, GCTC Prime Minister's Cup, L, 4th QTC Cup, Gr.2-twice, Qld Tatt's RC Recognition S., L, QTC Marco Polo H., L.
Cut the Nonsense. Winner at 1300m in 2014-15, 2d WATC Westspeed Nominations Closing H., Carlton Draught H., 3d WATC Westspeed H.
Poetic Vale (Yeats). 10 wins. See above. Our Communications (Esperanto). 11 wins-1 at 2-to 1200m, MVRC Highland H., 2d MVRC Moonee Valley Tabaret H., 3d SAJC Balcrest S., L, Walter Brown S.H., L.
KHOPROMISE (Khozaam). 6 wins from 1200m to 1600m, NZ$84,530, Egmont RC Fayette Park S., Gr.3, WRC Daewoo Lift Trucks H., 3d Counties RC Auckland Thoroughbred Breeders' S., Gr.2, WRC Cuddle S.H., Gr.3, Rotorua S., L. Producer. Race Record: 12 Starts 7-0-0 A$440,425. 7 wins-2 at 2-to 1200m, A$440,425, WATC Colonel Reeves S., Gr.3, Westspeed Nursery H.-twice, Crown Perth H., Tabtouch.mobi H., Rotary H., Auto Classic BMW H.